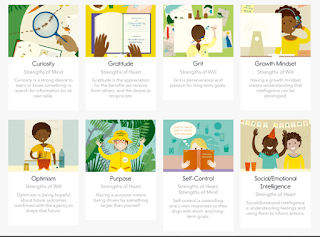 Character Lab is a nonprofit with an educational focus on the advancement of the science and practice of character development. Character Lab’s team is composed of dedicated researchers, designers and educators who work in unison to : ‘discover the ideas and strategies that build character, translate scientific insights into educational tools, and create next-generation measures for the purposes of research and self-reflection.’ Character Lab has funded and carried several research studies within schools and classrooms in order to analyze and find out the range of character strengths students can build on to lead a successful and thriving social, emotional and intellectual life. 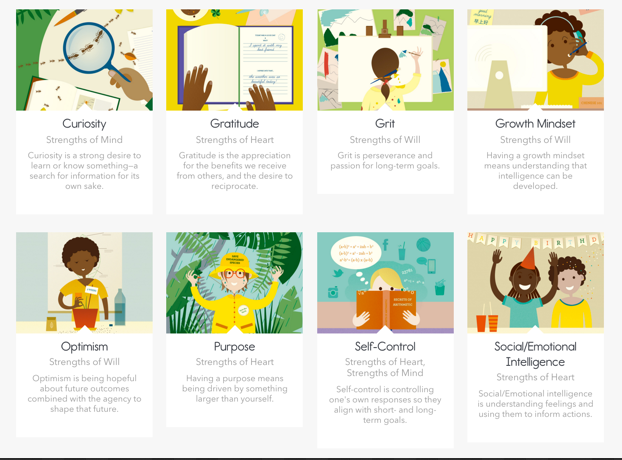 C- Strengths of Will includes: grit, mindset, optimism.